Panel talk on the "Violent" vs "Non-Violent" false dichotomy that often derails effective Criminal Justice Policy. All of Us or None is thrilled to welcome in conversation Danielle Sered, George Galvis, and Malachi Scott to talk about transformative responses to violence and building a movement to end mass incarceration that includes everyone—including people who commit violence. We know too well that all too often our movement draws lines between people convicted of non-violent and violent offenses that often leave people convicted of violence with little of the relief being sought administratively, legislatively or through the ballot box. 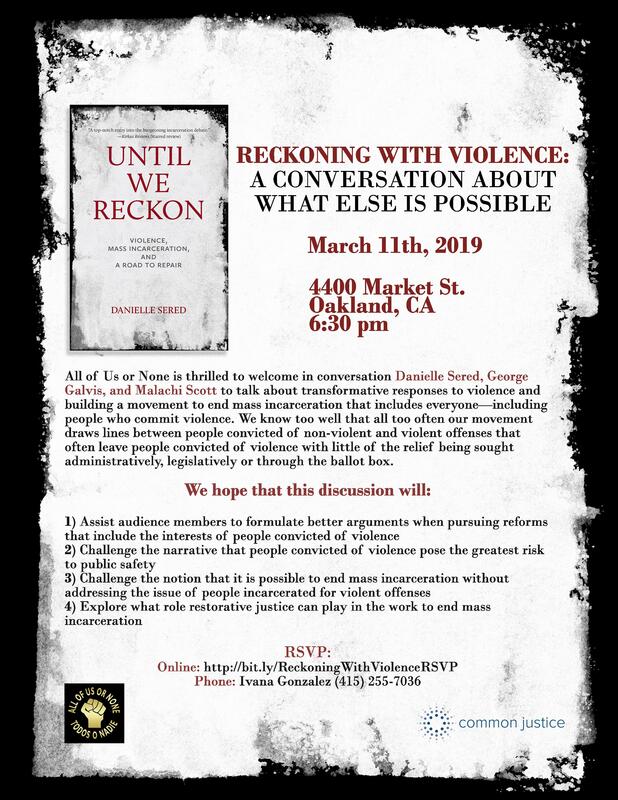 The panelists will use themes from Danielle Sered’s new book, Until We Reckon: Violence, Mass Incarceration, and a Road to Repair, as a launchpad for a visionary conversation about what else is possible. The panelists and the work they do will model what it looks like to steer directly and unapologetically into the question of violence, offering approaches that will help end mass incarceration, increase safety, and break down false barriers about who is deserving and capable of transformation. This conversation will happen in All of Us or None’s new space The Freedom & Movement Center, where every day people make what is possible real. Join us at 6:30 P.M. on March 11 at 4400 Market St. in Oakland.